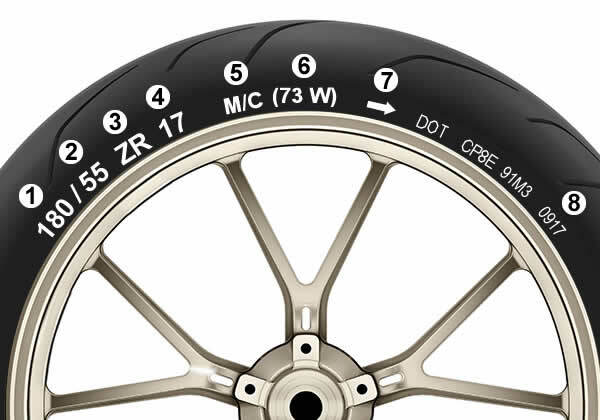 Those various numbers and markings on a motorcycle tyre sidewall can be confusing initially. This page will explain what those motorcycle tyre markings mean along with weight and speed tables that you can compare the tyre markings on your motorcycle to those in the table charts below. Let’s take a look at the tyre sidewall markings that are important. This number denotes the width of the tyre in millimeters from sidewall to sidewall. In this example, it’s 180 mm. The exact width may vary slightly due to manufacturing and tuning characteristics at +/- of 4%. This number is the tyre height and is calculated as a percentage of the tyre width. So in this example, the tyre profile height is 55% of the tyre width (180 mm), making it 99 mm. The speed rating of the tyre is represented by the letter ‘Z’ and is rated above 240 kph / 149 mph. Other speed ratings can be found in the table below. The “R” denotes that the tyre is of radial type construction. The other type of tyre construction is ‘cross-ply’ and if the tyre and if this was the case, the ‘R’ would be replaced with a hyphen. The number ’17’ relates to the rim size, so in this instance, it’s 17 inches. The ‘M/C’ simply means that the tyres intended use is on motorcycles. In this example, the number ’73’ informs us that the tyre has a maximum rating of 365 kg at maximum pressure. The the ‘W’ informs us that the tyre has a speed of 168 mph (270 kmh). The top speed is always related to the ‘slowest’ tyre on your motorcycle and if exceeded, risks tyre failure. Always replace a tyre with the same speed ratings so that you do not reduce the capability of your machine. See the chart tables below for all applicable load and speed ratings. The arrow denotes the direction of rotation. If the tyre is placed the wrong way round, your motorcycle will fail the MoT. Since the year 2000, the production date of any tyre can be found on a sidewall. We see the ‘DOT’ (Department of Transport) code and located at the end are four digits ‘0917’. The first two digits represent the week the tyre was manufactured and the last two digits represent the year. So in this example, the tyre was made in the 9th week of the year 2017. The speed index is a rating system denoted by letters located on a tyre sidewall. The speed rating of each tyre is the maximum speed in which a tyre can sustain under load, indicated by its load index and under specific conditions detailed by the manufacturer. If possible fit tyres to your motorcycle with identical speed ratings. Using a tyre with a lower speed rating can run the risk of invalidating your insurance policy. The load index is numerical code rating system that corresponds to the maximum weight that a tyre can support at the speed indicated by its speed rating and under specific conditions detailed by the manufacturer. The load index number can be located on the sidewall of your tyre.